Leaping out of the doghouse and onto the big screen, the hilarious hijinks of the good-natured Great Dane Marmaduke barks its way onto Blu-ray Disc/DVD Combo Pack and as a DVD Single Disc August 31 from Twentieth Century Fox Home Entertainment. An all-star cast of voice talents, including Owen Wilson, George Lopez, Kiefer Sutherland, and Fergie lend their voices to the dog-out-of-water tale about what happens when the lovable oversized pooch is unleashed in an idyllic seaside town. Leaping out of the doghouse and onto the big screen, the hilarious hijinks of the good-natured Great Dane Marmaduke barks its way onto Blu-ray Disc/DVD Combo Pack and as a DVD Single Disc August 31 from Twentieth Century Fox Home Entertainment. An all-star cast of voice talents, including Owen Wilson (Marley & Me), George Lopez ("The George Lopez Show"), Kiefer Sutherland ("24"), and Fergie (The Black Eyed Peas) lend their voices to the dog-out-of-water tale about what happens when the lovable oversized pooch is unleashed in an idyllic seaside town. When Marmaduke (Wilson) moves to a new neighborhood with his family, the super-sized teenage dog soon discovers he just doesn't fit in—literally! Marmaduke can't help being a one-dog wrecking crew, causing fur-flying chaos wherever he roams. But, with the help of his friend, Carlos the Cat (Lopez), Marmaduke may just get out of the doghouse, fall in love, and surf off into the sunset. 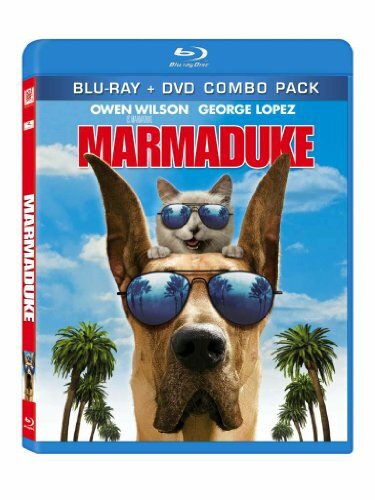 Just in time for some end of summer fun, Marmaduke Blu-ray Combo Pack (a two-disc set of Blu-ray and DVD versions of the film) comes packed with laugh-out-loud special features including more surf dog fun in Cowabarka!, canine casting, the Marmaduke Mahem gag reel, deleted scenes, and more, and will be available for the suggested retail price of $39.99 U.S./$49.99 Canada. The Marmaduke standard DVD, including deleted scenes and featurettes, will be available for $29.98 U.S./$43.48 Canada. Prebook is August 4.